When Karg raiders attack the island of Gont, the inhabitants of a small village are saved by a young boy who has discovered that he has magical powers. A sorcerer directs him to the island of Roke to there learn the ways of wizardry and controlling his abilities. Ged, as he becomes known, shows great promise but his pride is his downfall: an arrogant display of magical power goes awry, and unleashes a dark evil upon the world which only Ged can defeat. Originally published in 1968, Ursula K. Le Guin's A Wizard of Earthsea has become an acknowledged classic and required reading in the fantasy canon. Fantasy was in a far more nascent state in the 1960s than now, with the genre divided between more literary works (such as Gormenghast) and action-driven swords and sorcery adventures, such as the Conan tales by Robert E. Howard. However, the immense success of The Lord of the Rings had driven publishers to seek out or even commission more work in the genre. Le Guin agreed to write a story about a wizard, inspired by the idea of what Merlin was like when he was a child. For a setting Le Guin was struck by Earthsea, a vast archipelago of hundreds of islands she'd created for a couple of short stories in 1964, and began work on a story that expanded the detail of the setting considerably. She also tremendously popularised the "wizarding school" idea later used to blockbuster effect by J.K. Rowling. Le Guin didn't create the trope, which was first deployed by T.H. White in The Sword in the Stone (1939) and then by Theodore Cogswell in "The Wall Around the World" (1953), Robert Sheckley in "The Accountant" (1954) and Eleanor Estes in The Witch Family (1960), but she certainly ran with it. 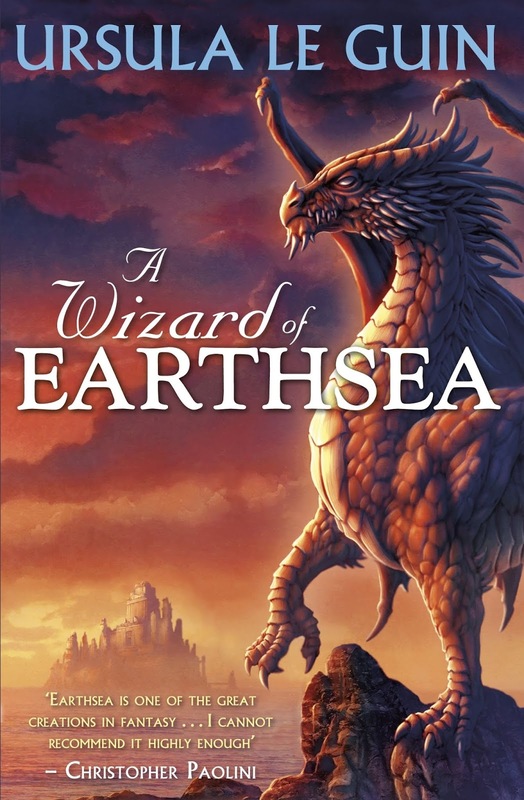 A Wizard of Earthsea is still, however, a work that wrong-foots the audience. Most such fantasy tales feature the hero encountering an external threat (a monster, a dragon, an enemy wizard, a dark lord) and working to overcome it with their wits, skills and the help of friends they meet upon the way. This book doesn't do that: instead, Ged's primary opponent is himself, his own hubris, arrogance and the dark shadow of his own soul. His enemy is his internal fears and weaknesses, given form. The result is a profoundly introspective book about a character having to find himself and grow up, but where the metaphor becomes literal. It's an audacious and, I suspect, slightly bemusing idea for younger children, but it certainly adds a tremendous amount of depth to the character of Ged, helping him avoid being a traditional "chosen one" hero figure. Before he can do any heroics in the future, he has to first come to terms with himself. Which isn't to say that Le Guin skimps on the other elements required for a classic fantasy. The worldbuilding is excellent and atmospheric, the small secondary cast of characters is well-drawn, and for such a short book there's quite a few memorable set-pieces, running from Ged defeating the Karg raiders with his wits, to his mage-duel with Jasper which goes horribly wrong to his epic confrontation with the Dragon of Pendor. The book also touches on the value of friendship and the true nature of a hero. A Wizard of Earthsea (*****) is fifty years old this year, but with its focus on internal conflict and its sophisticated worldbuilding, feels fresher and more vibrant than ever. It works well as both a stand-alone novel and as the opening novel of the six-book Earthsea sequence. It is available now in the UK and USA as part of The Books of Earthsea omnibus edition.